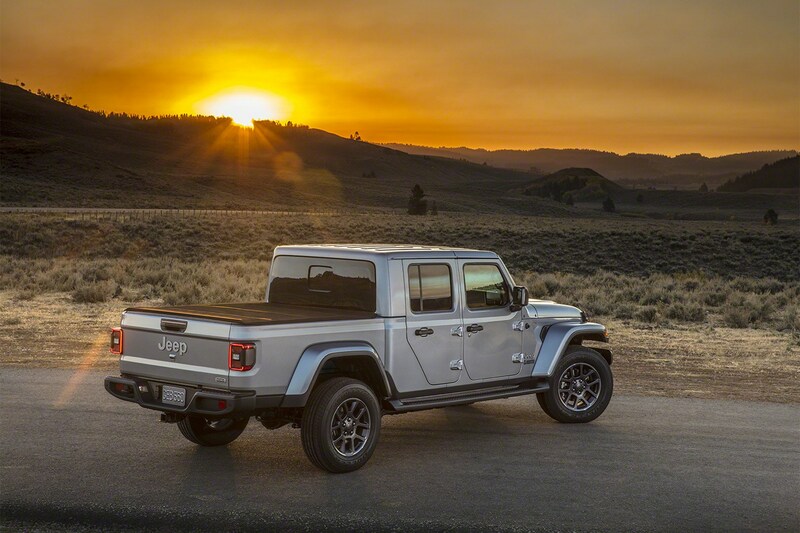 Jeep has pulled the covers off its first pickup in more than 25 years: this is the new Wrangler-based Jeep Gladiator. It has been revealed at the 2018 LA motor show, and follows on from the Cherokee-based Comanche that was on sale between 1986 and 1992. You can tell when those involved with a project have really put their soul into it. 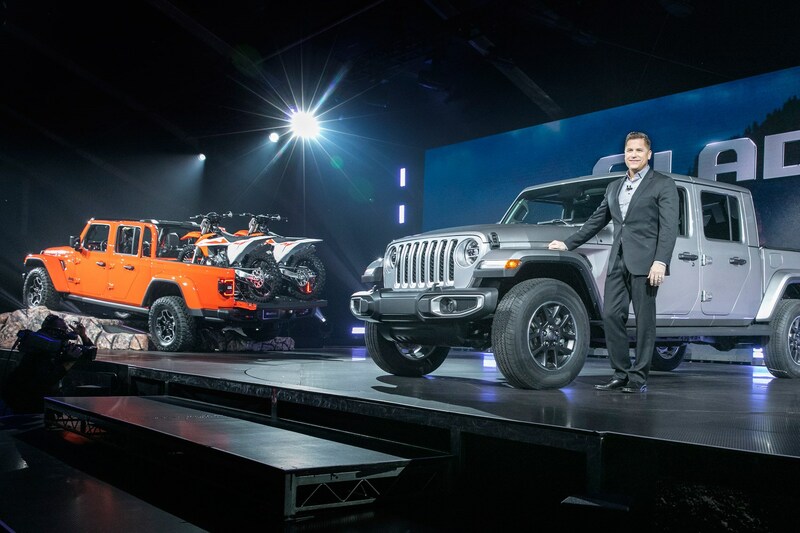 Mark Allen, Jeep’s design head, said the Gladiator was a ‘bucket list item for me.’ Years of visiting the Jeep Mopar Easter Safari has meant fans, owners and the community have come up to him saying they really wanted a new Jeep pickup. ‘It’s been two years of a labour of love for us,’ added John Mrozowski, the Gladiator’s line exec. 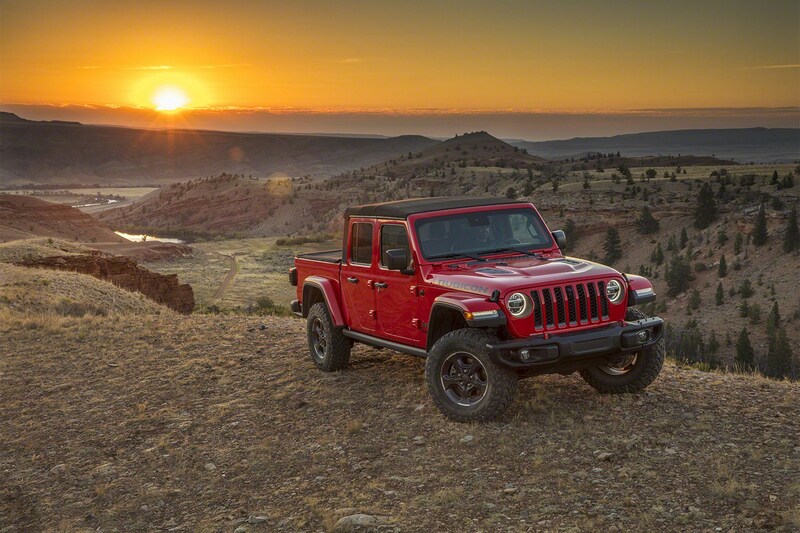 Read on for more on the new Jeep Gladiator pickup truck. Two engines are confirmed for now: a 282 bhp 3.6-litre V6 petrol and a 256bhp 3.0-litre V6 diesel, mated to a six-speed manual as standard or an eight-speed auto. 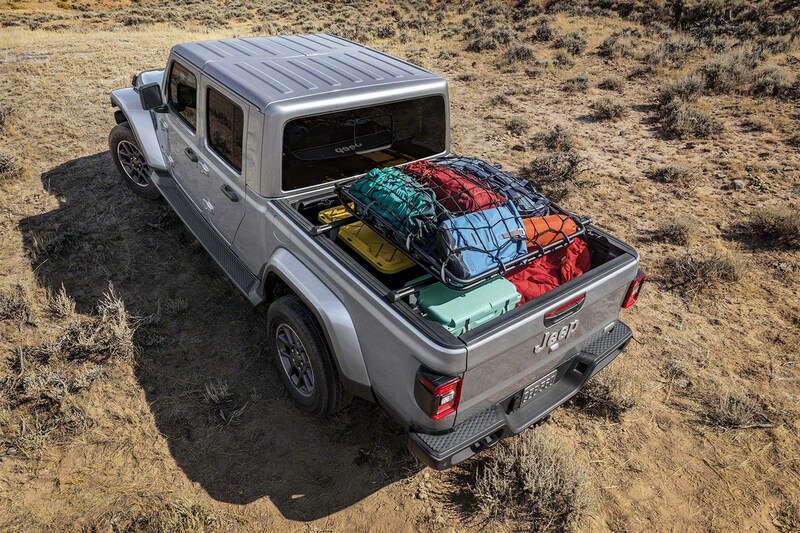 These are the engines confirmed for the US market – they might differ when the chunky pickup makes its way across the Atlantic. European Wranglers have a 269bhp 2.0-litre petrol or a 198bhp 2.2-litre 4cyl diesel, which may be carried across to the Euro-spec Gladiator. We’ll have to wait and see. 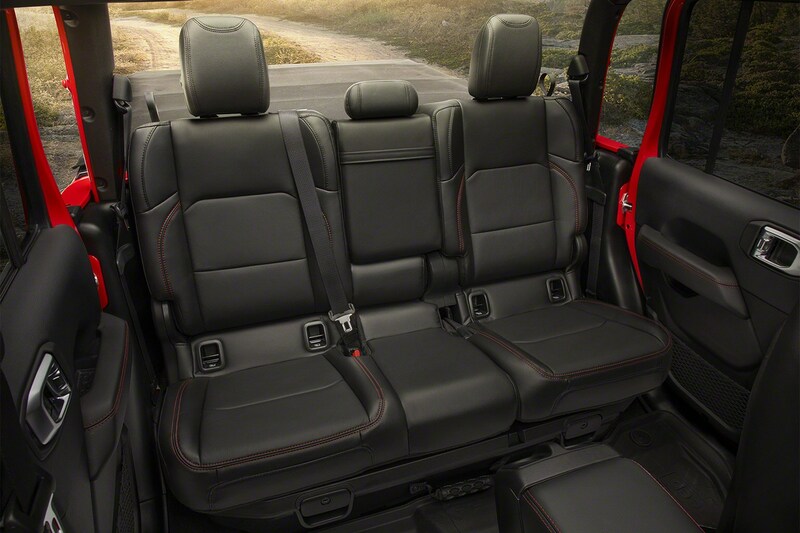 As for trims: Sport, Sport+, Overland and Rubicon are available in the US. 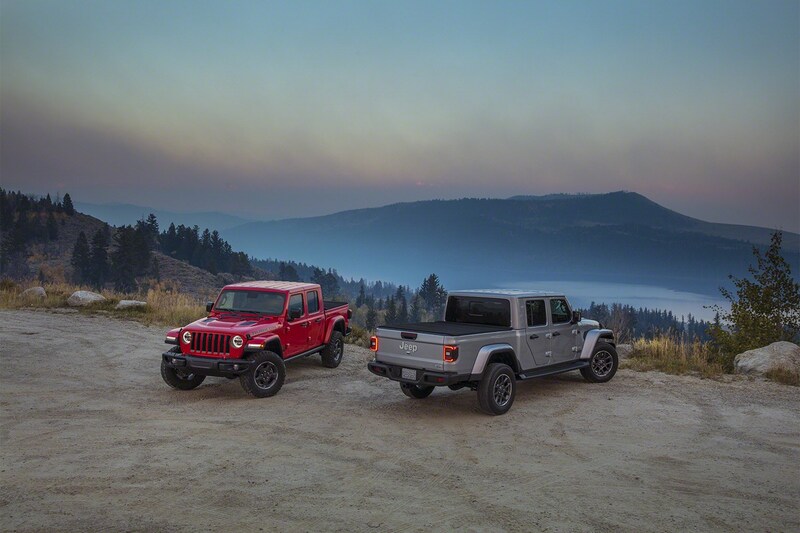 There isn’t a huge amount to separate the two Sport versions, but Overland is designed as a plusher, leather-bound country prowler while Rubicon (like the Wrangler it’s based on) is the extreme off-road version. 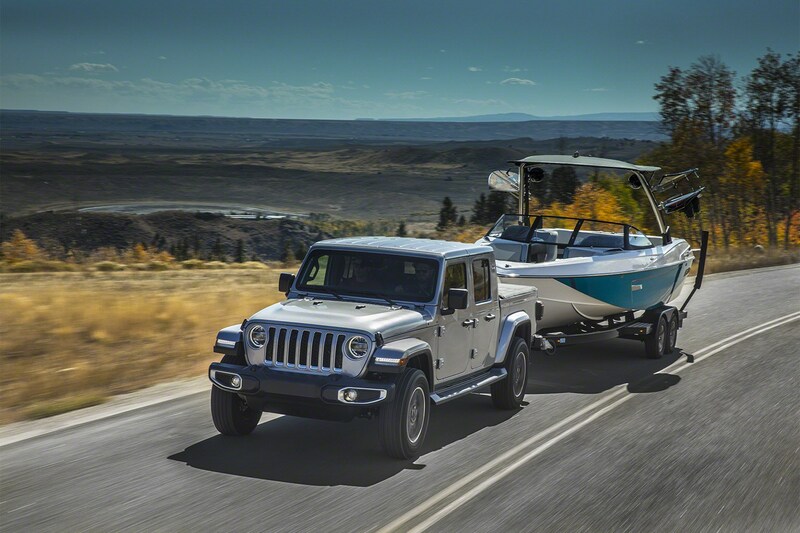 Like the Wrangler, the Gladiator will be hugely customisable even before you get to loading it up with Mopar accessories and performance mods. Mopar kit like door bars, lift kits and a glut of ‘lifestyle’ mods like bike racks and suchlike. All Gladiators have at least a seven-inch Uconnect infotainment system as standard, with the option to step up to an 8.4-inch screen. Other standard kit includes keyless start, a digital instrument screen housed between two dials and climate control. 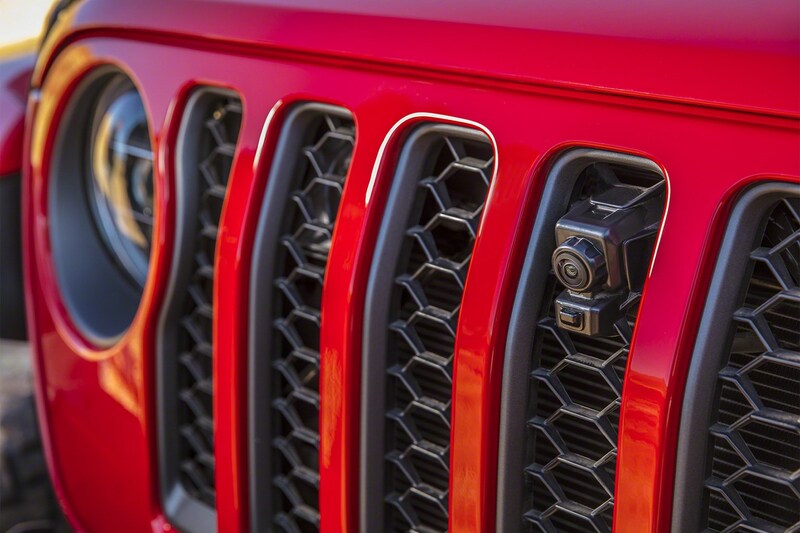 Rubicon models also get a camera mounted in the central front grille slat, nicknamed ‘TrailCam’ that allows drivers to see rough road obstructions more clearly. It’s still a proper off-roader, right? The Gladiator uses a body-on-frame design with multi-link suspension. The frame is steel, as is the loadbay, but the body panels and doors are aluminium. 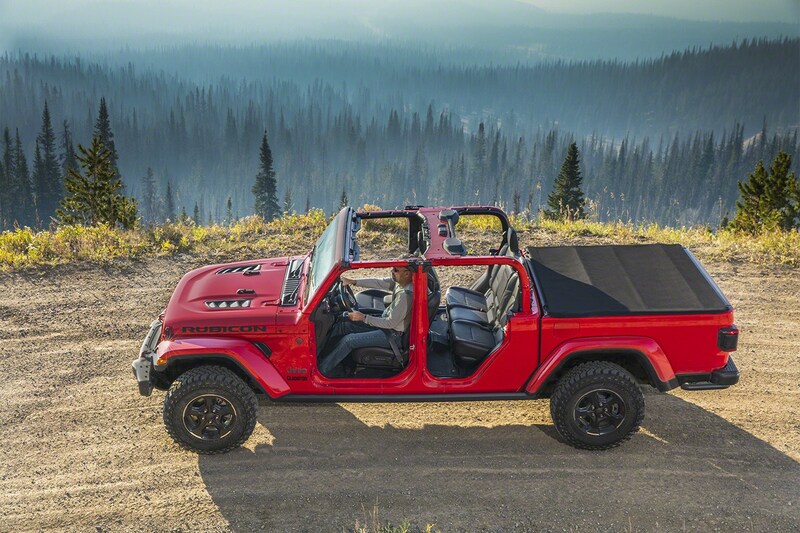 It also has a completely revised rear axle when compared to the Wrangler, given the fact it’s a pickup. 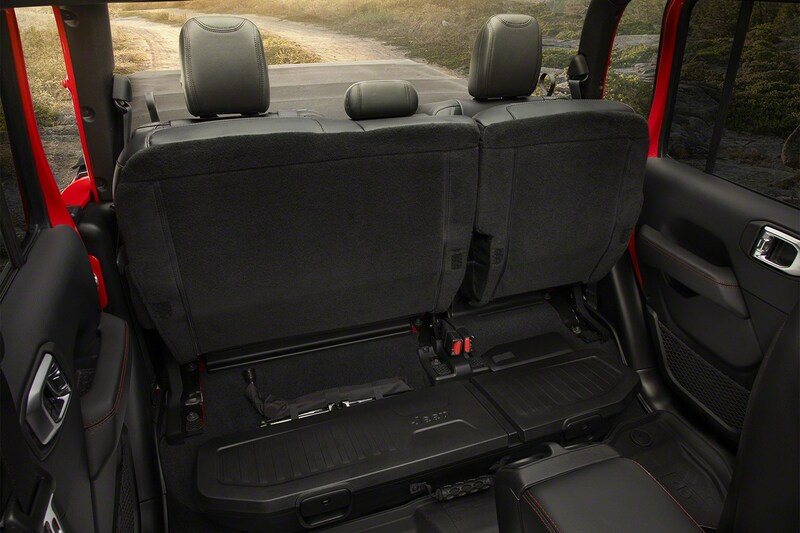 Naturally, all Gladiators feature permanent four-wheel drive, split between two drivetrain systems. Sport and Overland have a Command-Trac 4x4 system that has a two-speed transfer case with a 2.72:1 low-ratio. Rubicons use a Rock-Trac 4x4 system with ‘Tru-Lok’ locking diffs, a 4.10 front and rear axle ratio and a 4:1 low ratio. 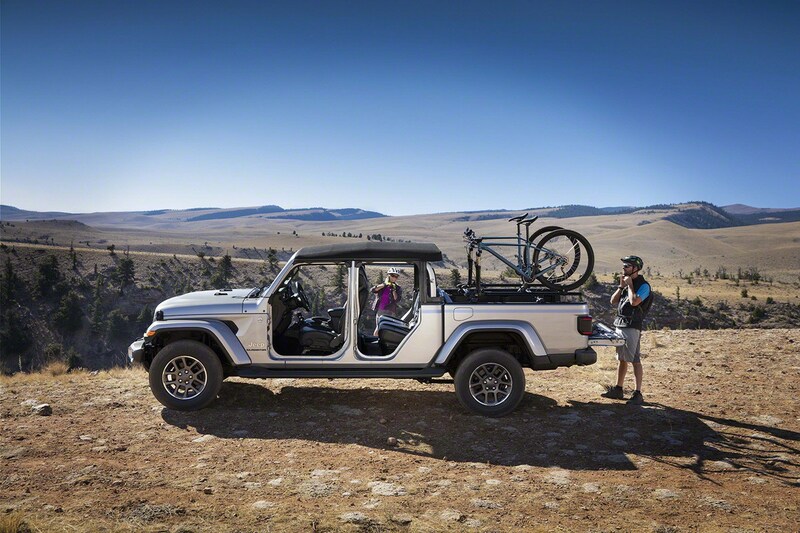 The approach angle is 43.6 degrees – the same as the Wrangler – but the additional length and rear overhand of the load bay has decreased the breakover angle (20.3 degrees) and departure angle (11.1 degrees) just a smidge. Wading depth is rated at up to 762mm. You can still tilt the windscreen forward, take the doors off with just a couple of bolts and the roof can be completely removed. The rear seat bench splits 60:40 and can be folded flat for storing boxes, or lifted up into a ‘stadium’ position to reveal a couple of under-seat cubbies. They’re open as standard, lockable covers are optional. There are tow hooks front and rear and space for a winch on the front bumper if you go for a Rubicon. As for the load bay, it can hold up to 725kg. Towing capacity is rated at 3470kg. 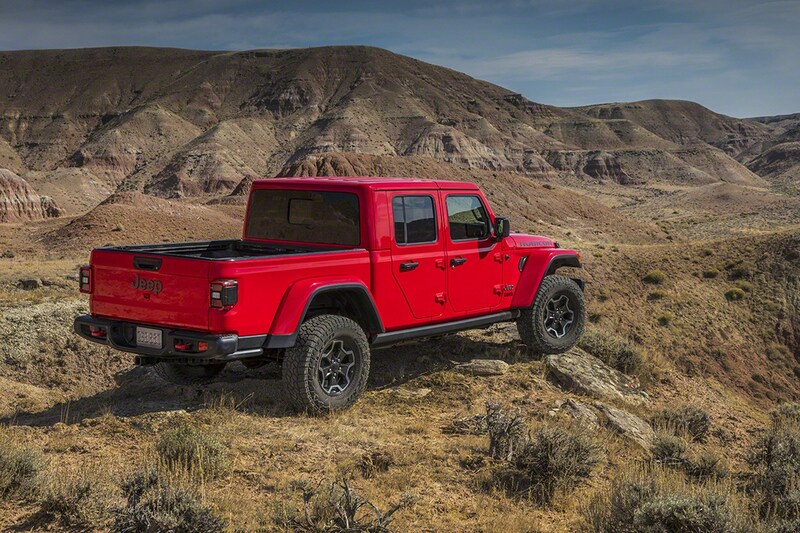 In the US, the Gladiator will go on sale in the first half of 2020. It’s confirmed for Europe, too, but expected to come later in the same year. 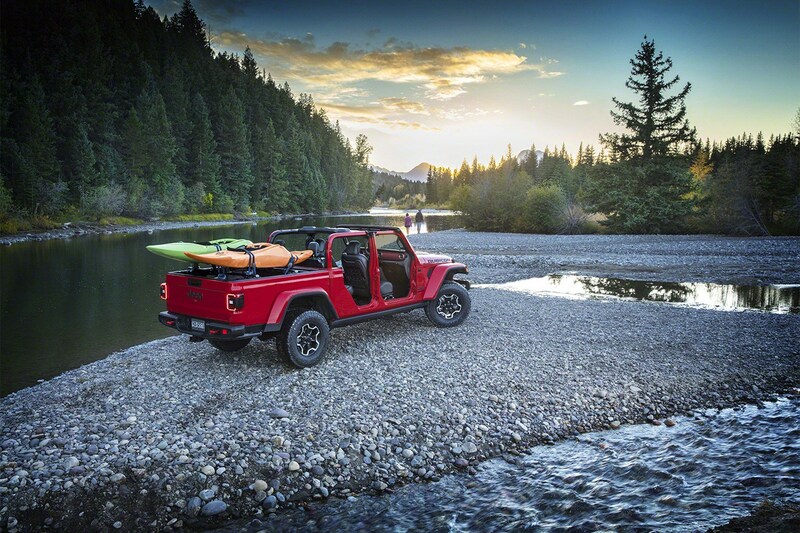 Jeep is also gearing up for right-hand drive models, so it could come to the UK. 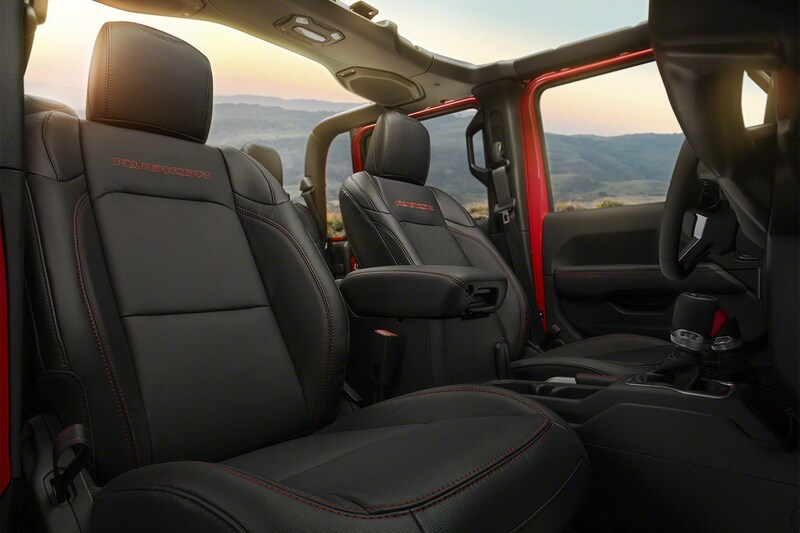 Prices aren’t known yet, but expect a Gladiator to cost a chunk more than an equivalent Wrangler.